2008: I'm not dead yet... Wait for a second. Wondering what stupid lines are they.. no its not.. its not that stupid as you think. And when it comes to TIME, every second counts. i would rather say every nano-second counts, as there are lot of advancement in time calculating devices which are precise to nano-second level. In this technologically advanced time period, why do we need to delay the birth of 2009? Oops.. Did i tell you that an extra second has been added to 2008? if not, i hav now :). That's because, sometimes, the Earth's rotation on its axis can take longer or shorter than 24 hours, depending on factors such as the breaking action of tides, snow or the lack of it at the polar ice caps, solar wind, space dust and magnetic storms. The International Earth Rotation and Reference Systems Service (IERS) has to occasionally add an extra second to keep our clocks in sync with solar time used by astronomers. The world's official timekeepers are adding a "leap second" to the final day of the year to help match clocks to the Earth's spin. 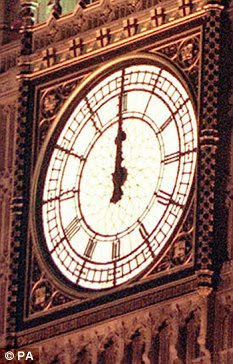 "The difference between atomic time and Earth time has now built up to the point where it needs to be corrected, so this New Year's Eve we will experience a rare 61 second minute at the very end of 2008..." Peter Whibberley, a senior research scientist at Britain's National Physical Laborator told the British media. The U.S. Naval Observatory, keeper of the Pentagon's master clock, said it would add the extra second on Wednesday in coordination with the world's atomic clocks at 23 hours, 59 minutes and 59 seconds Coordinated Universal Time, or UTC. UTC has been the world's official clock since 1967, and is accurate to about a billionth of a second per day, the US Naval Observatory says. It is used for broadcasting time signals across the world, and is essential for the smooth running of GPS and the Internet. Revellers ushering in 2009 will have to literally wait a second this New Year's Eve. With the economic slowdown, 2008 may feel as if it will never end. Along with the economy,the Earth itself is slowing down. Apart from these, while an extra second may mean little more than a slightly delayed kiss this New Year's, extra time can be problematic for time-sensitive computer software. UTC is used to keep time for most communications mediums such as broadcast signals, GPS navigation and the Internet. "There is a definite problem with leap seconds and the way that machines have been told to pretend they don't exist," Allen said. Most cellular phone providers and computer operating systems however do check with the world's atomic clocks and can accommodate the leap second if programmed to do so. These willy-nilly fixes can trip up time-sensitive software, particularly in Asia, where the extra second is added in the middle of the day. Critics say everything from satellite navigation to power transmission and cellular communication is vulnerable to problems stemming from programs ignoring the extra second or adding it at different times. Although the time will pass in the blink of an eye, Judah Levine, a physicist at the National Institute of Standards and Technology in Boulder, Colo., predicts the change will make him a very busy man starting about 5 p.m. Mountain Time. As part of the institute's Time and Frequency Division, he'll be helping to work out the bugs that follow. "There's always somebody who doesn't get it right," Levine said. "It never fails." But in practice, does it make a difference? I would say, depends on the kind of practice you're in. If you're writing programs for the critical systems, its the first and foremost thing you have to consider. If you're a person searching for Time-Towers to see the current time, then it does not make any difference. "Found New Updates. Do you want to Update now?" Some scientists now say GMT should be replaced by International Atomic Time — computed outside Paris — because new technologies have allowed atomic time to tick away with down-to-the-nanosecond accuracy. But opponents say atomic time's very precision poses a problem. A strict measurement, they say, would change our very notion of time forever, as atomic clocks would one day outpace the familiar cycle of sunrise and sunset. The time warp wouldn't be noticeable for generations, but within a millennium, noon — the hour associated with the sun's highest point in the sky — would occur around 1 o'clock. In tens of thousands of years, the sun would be days behind the human calendar. "I think (our descendants) will curse us less if we choose to keep the clock reading near 12:00 when the sun is highest in the sky," Steve Allen, an analyst at the University of California at Santa Cruz's Lick Observatory, said. Atomic time advocates argue that leap seconds are onerous because they're unpredictable. Elisa Felicitas Arias, a scientist at the International Bureau of Weights and Measures, which computes atomic time at a facility outside Paris, has been busy lobbying to scrap the leap seconds that have given the 17th century Royal Observatory pride of place. "GMT is out of date," she sniffed. She said she has been garnering considerable support, with the International Telecommunications Union — the arbiter of international time standards — considering a vote on a switch as early as next year, with a 2018 target to implement it. The U.S., France, Germany, Italy, and Japan were all on board, she said. But David Rooney, the Royal Observatory's curator of time, defended leap seconds, saying they give everyone "the best of both worlds." The arrangement, he said, allows satellites, physicists, and high-frequency traders to benefit from the accuracy of atomic time while keeping our clocks consistent with the position of the sun in the sky — and with GMT. "It's not just a matter for the telecommunications industry to tell everybody to get rid of the leap second," ... "It would be a big cultural change at the very least. Abandoning the connection between time and solar time is really a big shift."